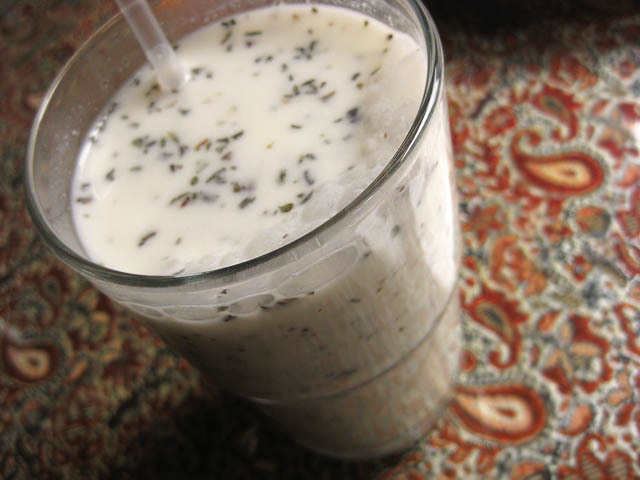 This drink recipe ("doogh") is a favorite concoction of mine. It's refreshing and simply delicious! I first tried it several years ago at a Persian restaurant, & I've been hooked every since. No, I didn't study Farsi or anything, but I've certainly have overheard enough of my Persian friends chatting amongst themselves to pick up a smattering of the language here & there. ;-) I also happen to have prior knowledge of other Semitic languages as well, and in general, enjoy speaking and learning foreign languages, so that certainly helps as well. I've also done a lot of international travel, and enjoy studying about and immersing myself in different cultures and environments, etc., etc. But anyhow, back to the drink recipe. 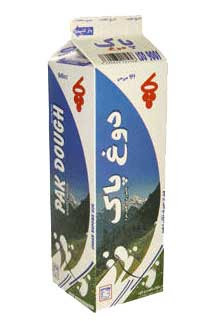 It doesn't taste anything like salt lassi, if you are used to drinking those, although it is a salty beverage. I actually like doogh much better than most of the salt lassis I've tried. (It does taste a bit more like mint lassi, however.) Doogh usually has a refreshing, cool, minty taste, (OK don't worry, it's NOT anything like toothpaste! Hahahaha! ), and as a result, you'll probably feel much revived from drinking it! I'd particularly recommend drinking it on a hot summer's day. The drink has excellent health properties, so you can really enjoy it anytime, & also feel great about the fact that you're putting something good into your body as well! But enough about this. Let's get down to it, & give you that recipe! This is the recipe I came up with after much trial & error, in order to get the perfect balance of savory & salty flavors. Enjoy! Directions: Pour yoghurt, mint, salt, & pepper into a pitcher. (I actually think it's easiest to pour all of the ingredients into one of those empty gallon milk/water jugs, put the cap on tightly and just shake it vigorously, putting your free hand on top of the cap & pressing firmly while shaking. IMPORTANT: PLEASE do NOT use this technique if you are using club soda!!!! Or you might find yourself wearing your dough instead of drinking it! )Add club soda or springwater gradually, stirring constantly. Add 3-4 ice cubes and mix again. Serve chilled. If this is the very first time you'll be making this drink, you might want to stick to the recipe the first go-round, and then start getting creative after you've gotten a sense of the essence of what it tastes like. Of course, you can do as you wish. But don't say I didn't warn you! I'll admit to many a "doogh disaster" -- either because I'd shook the container a bit too vigorously (Hey, it feels really good give that thing a good, hard shake, OK!?! ;-) ), or had over-salted, over-peppered, and yes, even over-minted this drink (if that's even a word!). Well, they don't call it "trial & error" for nothing! I'm certainly not afraid to admit to making these mistakes, as the end product has turned out even better as a result. If you don't try, and if you don't experiment, how will you ever know what works best?! Also, I usually double , triple, or even quadruple (!) the recipe, and put the drink mixture into a gallon jug (or two!). What can I say, I really like this drink (! ), and drink it regularly throughout the summer. Hope you'll like it as much as I do too! Who knows, maybe it'll even become one of your new favorites! As a foodie myself I will be spending quite some time going over your back-catalog of recipes! As I believe you've seen already I run the Taming Entertainment blog, and I'd like to chat to you about the possibility of you contributing some of your wonderful writings if you would be at all interested? You can get in touch with me at shiv379 at gmail dot com. Hope to hear from you, and keep up the great work!! Hmmmmm...this does not sound good to me at all. But maybe I should just take a deep breath and try it, huh? Thanks, Shiv, for your interest in this blog & the recipes posted here, & for the offer to write for your blog. While I'm certainly flattered by your offer, I'm not sure how much time I'd have to contribute to writing to another blog, as right now it's been challenging enough juggling all of the activities in my life & maintaining 4 existing blogs. As is, I just dropped 2 blogs due to lack of time due to lack of time! (I started out with 6 blogs & am now down to 4.) If things should change, I'll let you know. Thanks for thinking of me! Good luck with your highly entertaining blog. Many of my recipes are geared to those with international tastes in food, so if you aren't accustomed to these types of foods, it will certainly be a new adventure for you to try a recipe like this. By the same token, if you don't think this recipe's for you, then of course, you are under no obligation to try it. While I generally like to have an open mind when trying new things, I also have tried enough different types of dishes & cuisines to have a good sense of what I generally like & don't like. So, it's up to you whether or not you'd like to try this recipe. Got an idea for you. If you're really curious to try this drink then I'd advise going to a Persian restaurant & trying the drink first to see if you even like the beverage before attempting to make it yourself.